The EVT combines the compactness and performance of the VRT series with a right angle bevel system to provide the ultimate space saving solution for highly dynamic applications. 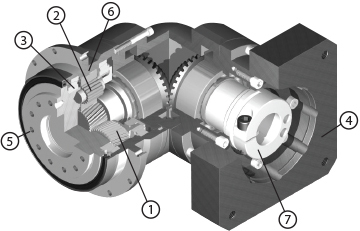 The ISO flange interface allows for easy mounting of index tables, pinions, timing belt pulleys and other mechanical components without the need for a coupling. The EVT is advantageous in applications requiring high accuracy, torsional stiffness and moment loading. 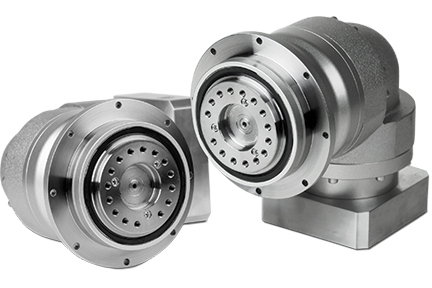 Oversized dual tapered roller bearings allow the EVT to handle larger radial and thrust forces found in applications within the machine tool, aerospace or robotics industries. Available ratios range from 3:1 to 100:1—a total of 20 ratio configurations, giving machine builders more design flexibility than ever before.